We would like to involve you in the future care of the Riverside Walk. This might be through practical involvement, monitoring or just keeping you updated. The River Ouzel (also known as the Lovat) rises from chalk springs in the Chilterns. It flows northwards, through Leighton-Linslade, cutting a gap through the wooded sandstone hills of the Greensand Ridge before passing through the east side of Milton Keynes and joining the River Great Ouse at Newport Pagnell. The Clipstone and Broughton Brooks are two of its main tributaries. 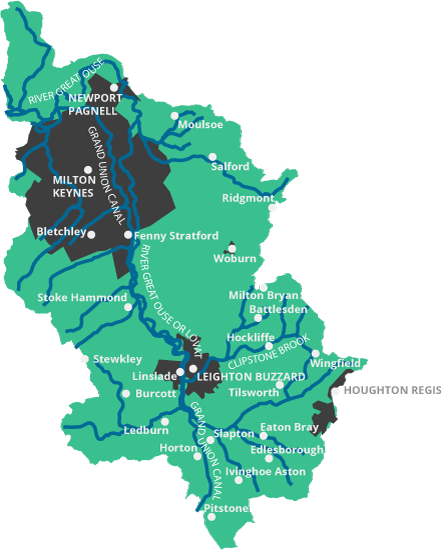 This catchment includes a the Loughton Brook (draining west Milton Keynes), Tathall Brook and a section of the River Great Ouse (Wolverton to Newport Pagnell) where the valley delineates the northern boundary of the designated new town of Milton Keynes. . The Grand Union Canal runs north-south along the River Ouzel valley. The major urban area of Milton Keynes dominates the north of the catchment, where the River Ouzel has been significantly modified by flood management schemes, including the two large balancing lakes at Caldecotte and Willen. There are linear parks along the main watercourses and floodplains and these are a defining feature of the city. Leighton-Linslade is the main settlement in the south and the Ouzel’s floodplain provides a major area of accessible open space stretching through the centre of the built up area. The rest of the catchment is mainly rural with mixed agriculture including extensive floodplain grazing, and the river remains relatively small and intimate with meanders, riffles and pools. One theory for the origin of the name ‘Ouzel’ is a historical association with the dipper, a thrush-sized bird now largely associated with upland rivers and streams, but which is featured on the town crest of Leighton-Linslade. Kingfishers can be seen along the river, which brings nature close to many people through the two main settlements. Records of otter are increasing along both the Ouzel and Great Ouse in Milton Keynes, and ancient willow pollards and rare black poplars are an important feature of the Ouzel’s cultural and physical landscape. The Environment Agency has been surveying and monitoring water quality in the Ouzel and Milton Keynes catchment against WFD criteria since 2009. Details of the findings can be found from page 46 in the Upper & Bedford Ouse Management Catchment – Catchment Summary. The status (health) of the water environment in 2009 was assessed as being generally moderate, and while in 2013 the picture was broadly similar there were some changes – the number of waterbodies assessed as good had increased from 2 to 4, the number assessed as poor decreased from 2 to 1, but the number assessed as bad increased from 0 to 1. Through local consultation and engagement issues such as Invasive Non-Native Species (in particular Himalayan Balsam and signal crayfish), litter and fly-tipping and low flows have also been raised. The Upper & Bedford Ouse Catchment Partnership together with local groups, land owners and interested parties are working to identify projects and activities which can address these issues, to maximise the number of good water bodies within the Ouzel and Milton Keynes Operational Catchment. Please navigate around the Ouzel and Milton Keynes operational catchment map to see current, planned and completed projects. More projects will be added as they arise. The Ouzel Enhancement Project evolved from an Environment Agency Walkover Survey carried out in 2013, which identified the need to improve the habitats and channel diversity – the stretch alongside the Riverside Walk greenspace in Leighton-Linslade (owned by Central Bedfordshire Council) is a former mill leat and is straight, steep sided and over-widened. This meant that for much of the year the river was sluggish and silty. Naturally regenerating sycamores along the banks had grown to such an extent that in places very little light was getting into the channel, and there was little plant growth. Coupled with Himalayan Balsam taking over large stretches of bankside and shading out native plant species, and signal crayfish (another invasive non-native species) burrowing into the banks and undermining them, causing erosion and sedimentation, the river didn’t have a lot going for it! 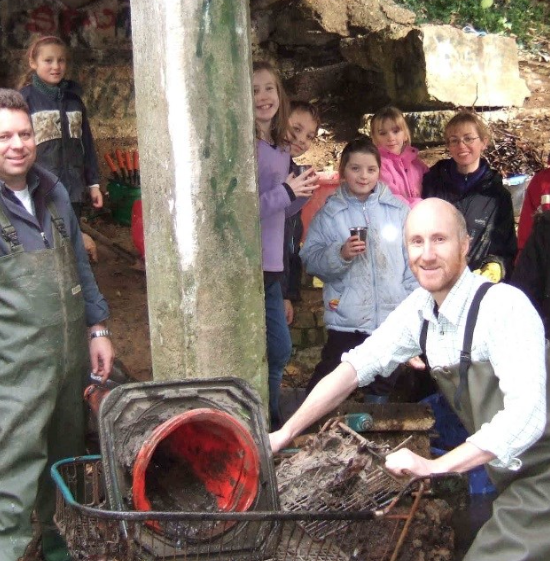 Over the last four years volunteers from the Greensand Trust, working with the Environment Agency, have carried out various tasks to help improve the river for wildlife and make it more attractive for residents and visitors. Firstly the volunteers installed over 100m of hazel bundles along the edge of eroded banks, helping stabilise them, reduce the amount of silt getting into the channel and discouraging the signal crayfish. Next the large willow trees growing in the channel, and ‘rafts’ of debris that had collected around them, were removed. The bankside sycamores were thinned to let more light through the canopy, and they were used to create a series of “flow deflectors”. These deflectors force what is currently a sluggish river around them, speeding up the flow and cleaning gravels vital for spawning fish and invertebrates. Quote from Paul Wilkanowski, EA Fisheries Officer: “By felling trees already growing in the river, and using a small amount of this material for restoration, the works reduce the risk of flooding, while letting in more light to make a gloomy stretch much more attractive”. Volunteers have also been involved in monitoring the invertebrates that live in the stretch, so that the impact of the improvements can be more accurately demonstrated. The volunteers have surveyed three times a year for the last two years, and have built up a good baseline of evidence, against which future improvements can be measured. During one of their sessions the volunteers also identified and reported a pollution incident that would otherwise have gone unnoticed. Initial surveys of the river bed where the deflectors have been installed have shown that changes have already occurred, with sand and silt being washed away by the faster currents and exposing the gravels needed by a range of invertebrates and fish. The deflectors have also provided ideal ‘refuge’ areas for fish seeking protection from flood waters, and a larder for the kingfishers, herons and little egrets along the river. The project has been funded by Central Bedfordshire Council’s Planning Obligations Fund and the Defra Catchment Partnership Action Fund, with continued support through the Upper and Bedford Ouse Catchment Partnership and the Environment Agency. Future plans include further bankside protection and tree thinning, and hopefully more deflectors – the aim is to use the works carried out so far to act as a demonstration before widening the scope of the project further.